Remains of one of the city’s very early dentist rooms have been discovered by workers on the development site at Queen’s Wharf Brisbane. The building footings of Eden Chambers, also known as Eden Place, have been unearthed along George Street during piling work at Queen’s Wharf. Tina King, Project Archaeologist from Urbis, said it was an interesting find and one that hadn’t been expected. “We do a thorough assessment of the past land use and disturbance of a site before excavation works start to determine any areas of sensitivity and ensure they are managed appropriately (by archaeologists) during works,” Ms King said. The foundations, which were made of a rough concrete mix that used river pebbles, broken bricks and Brisbane tuff – were located by Probuild during excavation work. Following the discovery, project historians scoured historical plans, aerial photographs, post office directories and newspaper archives dating back to European settlement to confirm the footings’ origins and age. They discovered the orientation of the footings matched Eden Chambers which were first occupied by Dr R Eden circa 1890, later becoming Eden and Hughes Dental Practice in 1894. 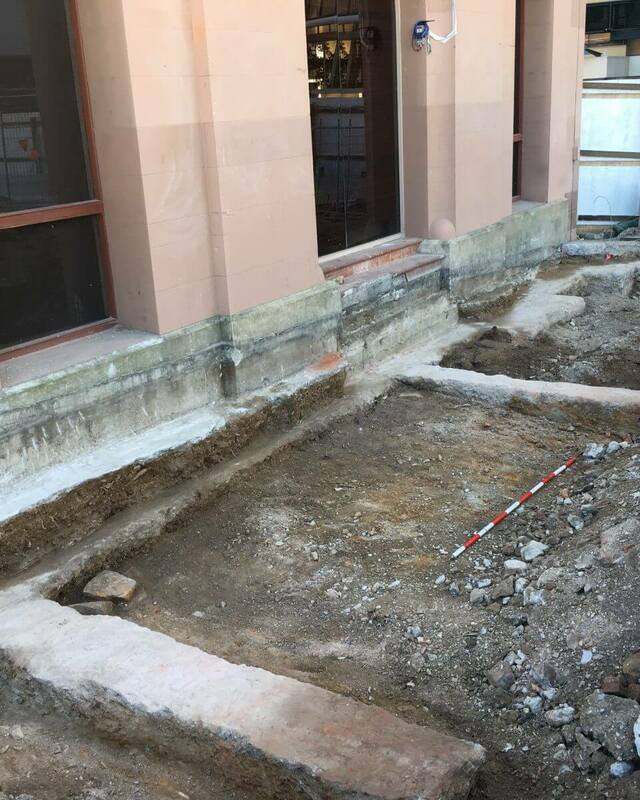 The footings were located in an area of George Street where residential and commercial premises were located in the late 19th century, including the heritage-listed Harris Terrace, the Government Printery and a number of boarding houses. The building housing the dental practice was later occupied by the Forestry Department in the mid-20th century, before being demolished to make way for the Queensland Government Executive building in the 1960s. Probuild Project Manager Greg Sneeden said the find was surprising, as most areas of the Queen’s Wharf Brisbane site have been disturbed. The find has been recorded in accordance with the approved Archaeological Management Plan.